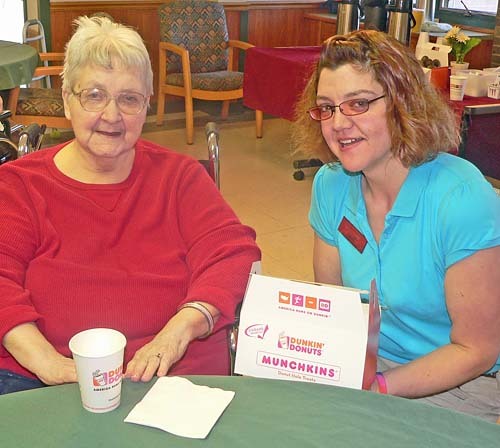 Pictured (left to right) is Michaud resident Mildred Gadziala and Fulton Dunkin’ Donuts Manager Sharon Smith. Smith brought all the fixings for a first-class coffee hour celebration for residents and staff at Michaud Residential Health Services in honor of National Nursing Home Week. FULTON – The folks at Dunkin’ Donuts in Fulton helped residents and staff of Michaud Residential Health Services continue their celebrations of National Nursing Home Week with a special coffee hour, sponsored by Dunkin’ Donuts. Dunkin’ Donuts Manager Sharon Smith brought all the fixings for a first-class coffee hour celebration. The theme for National Nursing Home week is “Exceptional People, Exceptional Care” with today theme,” Exceptional Community”.